What Will New Wilmington, DE Homes Look Like in 2015? The current state of affairs within the housing industry has many wondering what lies ahead in 2015. Changes are being made to match the current trends within the industry— not only the number of new homes being built but also what’s inside newly-built homes. A recent study by The National Association of Home Builders (NAHB) surveyed a group of builders, designers, architects, manufacturers, and marketing specialists. “We asked builders, ‘what do you anticipate the new home size would be by 2015?’ The overall consensus was found to be “houses will get smaller," said Director of Economic Services of the NAHB, Stephan Melman. The study found that homebuilders expect newly built single-family homes to average 2,150 square feet compared to the current 2,400 square foot average. This aligns well with the trend of going green that we can expect to see more of in 2015. Smaller homes have greater heating and cooling efficiency gains associated with less space. Builders are also utilizing water-efficient appliances and plumbing, using LED and compact fluorescent lighting, as well as installing energy efficient windows. Other amenities will also be affected, such as the “Great Room” replacing the “Living Room”. The “Great Room” combines the living room, dining room and family room into one open space that usually flows into the kitchen which helps save square footage. The changes ahead in 2015 seem to be positive for all involved and the goal of a better home in the Greater Wilmington, Delaware area will be met for builders and buyers alike. According to new research from RealtyTrac, saving enough money for a down payment—typically 20 percent— could take as long as 12 years for first-time homebuyers. Based on median home prices and the current personal savings rate of 5.6 percent, buyers would need to wait until they're 42 years old to purchase a home. Saving 20 percent for your first Wilmington, Delaware home can be overwhelming, especially when you have additional debt from credit cards or student loans. However, there are other ways to help you save up to buy Wilmington real estate. Consider these 4 easy ways to save for a down payment and if you're still feeling uncertain about buying a home, contact the KG Home Team! We're happy to answer your questions and even offer FREE first-time homebuyer seminars! With expenses like car insurance, renter's insurance, cable, internet and a cell phone plan, the costs can put a damper on your saving for a home. Start shopping around for better prices to bring the numbers down. Simply switching to a new provider could help you save hundreds more per month. If you haven't yet, make a budget to help you pin-point your monthly costs and develop a better timeline for buying a home in the Wilmington area. Where is your money going each month? Are there places you could cut back? For instance, dining out is one expense many prospective homebuyers could stand to eliminate. Rent is likely the largest expense you have per month and the one that would allow you to save more for a down payment. If you're in good standing as a tenant, consider speaking to your landlord about lowering your rent or perhaps downsize to a smaller apartment and deposit the difference in rent into your savings account. Depending on the type of loan you have, you may be able to scale back on your payments. Speak to your lender or student loan provider about repayment options, including income-based repayment. Lowering your payment each month could allow you to save more for a Wilmington home. The KG Home Team can help you every step of the way as a first-time homebuyer. If you have questions about down payments, mortgages or the current real estate market, do not hesitate to contact us! Underwater But Want to Buy a New Home in Wilmington, Delaware? So you bought a home in Wilmington, DE in 2006. It lost 20-40% of its value, but today you could break even, hopefully. You want to buy a new home, but don't really have any equity, what should you do? You're not too confident in the housing market, but you know rates are great? The real question should be, "What would you pay today to put income in your pocket and a roof over your head for the rest of your life?" Today you have a once in a lifetime opportunity to buy a new home in Wilmington or Newark, keep your old home and own them both in 15 years! What would your life look like if you owned two homes in 15 years? You could use the income from one to live in the other, have a roof over your head for life and have a retirement income! Act now— this opportunity will go away within 1-2 years max. Interest rates are going up! We have been at a 100 year low and you won't be able to create wealth like this ever again in your lifetime! That's right, when rates are back to 6.5-7%, you will not qualify to keep your old house and buy another. You might be lucky to even buy one home on a 30-year mortgage, let alone a 15-year mortgage. The choice is yours. Stay put, be conservative, wait to see what is going to happen with the real estate market. Keep your "old" house, hunker down, wait and see if rates really will go up? You purchased your existing Wilmington home in 2006, paid $255,000, it went up, then down, then down some more, now it is back up to a little less than you owe. Why sell? Keep it, rent it for the monthly payment at 5.5%. Your payment is $1636 and fair market rent should be at least that. Pay $600 a month extra in addition to rent and you own it in 15 years! Your new home is $300,000. Instead of doing a 30-year mortgage at 4.25% with a payment of $2026, do a 15-year loan at 3.5% and pay an extra $695 per month! To recap: For $2,600 more per month over 15 years, you can own both houses, earn an income of $2,000 per month for the rest of your life and own your home free and clear. With the leverage of reverse mortgages, you could have $4,000-$5,000 per month with no house payment for the next 15-20 years! If you have been wrestling with yourself, your spouse, your parents or relatives— BUY NOW! You will forever be a genius. 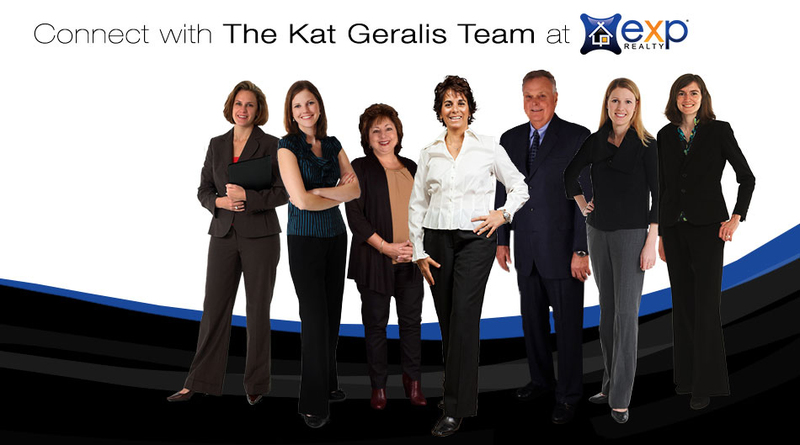 Your real estate agent with the Kat Geralis Home Team can help you navigate the current real estate market and take advantage of mortgage rates. We cover all of the bases when selling your home, so you don't have to— just one of the many reasons to avoid For Sale by Owner this year.